I was asked by a friend to share Arthur Naiman's beautiful poem again, in the context of the classic poem that he was responding to by Gerard Manley Hopkins. It was my privilege to meet Arthur at a writer's group in Tucson. He is an extraordinary journalist, activist, and poet, and I'm grateful to him for sharing "Contra Hopkins" with me. I'm finding this blog difficult to maintain, although it was my intention to document the progress of this residency through August. 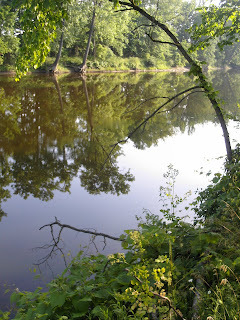 I've been given an apartment close to the river, surrounded with considerable forest, and I find the solitude more difficult than I imagined it would be, bringing confrontations with self and circumstance. Who am I, to ask to speak to the Earth, with art or anything else, who am I to try to talk about "connectedness"? And yet........I woke up this morning with all of these questions, and the first thing I saw, as I turned on the light next to my laptop, was the "Book of Grace" by the Terma Company (1990), which I had been reading last night. Next to it, on the table, was a little spider that jumped (yes, jumped!) on to it. And sat there, right on the cover. A spider on the Book of Grace. Here it is, that living metaphor, the hand of the Spiderwoman. How do we talk to the Earth? Perhaps the Earth is talking to us all the time. With the mythic imagination, with synchronicity, with dreams, around and through each other and all the beings we encounter, of which we are only one variation. The dominant species, but only one among many. The real question is, how can we learn again how to join the conversation, and urgently, how can we speak for the Earth. For all those Relations voiceless before the forces of modernity, the momentum of the 6th Extinction - and for those, like my own new grandson, who must live within the consequences of my time. Stephanie and Yugi, my dancer colleagues, have decided to collaborate with me on the short performance we will give at the end of the residency, for which I'm very grateful. And while walking in the forest near me yesterday, I saw how the collaboration with Kathi from Space Ceramic Studio here could work. I think I'll call it Prayers for the Earth, and we'll invite the participants to make terra cotta (bisque fire) masks from their own faces, along with casting their hands in the same manner. Each hand will hold a "thread" from the Web, knotted to symbolize their experience of connection, and with a personal prayer written into it. I think it will be both a beautiful work of art, individually and collectively, and a wonderful affirmation for all of us. I'm grateful indeed to Kathi Space and her husband for the inspiration. I've been reading THE GURU PAPERS - Masks of Authoritarian Power by Joel Kramer and Diana Alstad. It's a brilliant and disturbing book that examines and challenges many of the assumptions inherent in both Western and Eastern spiritual traditions, as well as contemporary manifestations of these systems. I don't have the means to discuss the depths of this book at present, but the most important point the authors develop, for me, concerns the evolution, the "masks" of authoritarianism inherent in our "renunciate" traditions. They illustrate, over and over again, from Animism to Polytheism to Monotheism (including New Age variations on these themes ) the ways in which our religious and spiritual systems have increasingly abstracted humanity from any kind of conversant relatedness to the earth. Indeed, even to our own embodied existence. As I read, coincidentally, the word "numinous" kept coming into my mind. The Goddess Pomona, Goddess of orchards and fruitfulness, was originally a local Roman “Numen”, a beneficent spirit of place, such as might be worshipped in the form of offerings at a sacred grove or spring, before she became a goddess as Roman culture evolved and became more complex. To our ancient ancestors, perhaps the people who built Stonehenge, or Chaco Canyon, or the stone cairns in Putney Mountain, Vermont, or the Serpent Mound in Ohio, or those who made pilgrimages long ago to the beloved well of Brigit in Ireland …….. Perhaps to them, speaking with the Numen, the Spirit of Place, was not an abstract idea at all. It was an exchange. Mask in Progress: "THE RIVER FACE"
5 Masks are mounted on sculptural stands. Dancer(s) are interacting with the masks, which can be removed from stands, and held on poles, or be worn on face. it gets strange, very strange indeed. and what the observer is thinking. Form, it would seem, has an identity crisis. Is talking to us all the time. by freezing water, and observing what happens. "Water", he writes, "exposed to the words "thankyou" formed beautiful geometric crystals, no matter what language. But water exposed to "you fool" and other degrading words resulted in broken and deformed crystals." What's a word, but a crystallization of a thought? with a magic marker. I am drinking gratitude now. Tsityostinako is singing the world into being. and then she taught her daughters how to sing. "filled with seeds, and little pictures of animals. like a spider, and very difficult to see. So small and she is everywhere. there, to help her grandchildren. Then the guestbook began filling up with spam, even pornographic spam. And notes between friends became group emails, then increasingly impersonal things, like political information, or, of course, announcements of openings, books, shows, etc. for me to circulate. And those little chain mail prayers and uplifting stories you have to pass on to "10 more people" in order to benefit from whatever kind of grace so doing so would accrue, all the while being information gathering devices for spam companies. Realizing that people receive hundreds of emails to read and process, I share less and less via the internet. Sometimes, on my not reasonable days (like today), I feel the whole world has ADD (and not just me) and can't tell the difference between a poignant moment of real human contact and a sitcom. Between, as my favorite author Ursula Leguin wrote, "blue mud and the true azure". Could it be possible there are other people like me, fraying, unraveling, beginning to say strange things to electronic answering machine menus that get longer and longer and more labyrintine........lingering for meaningful conversations at checkout counters........mumbling Rilke or Lessing while ordering coffee at Starbucks drive thru......are they quietly wondering if they really are becoming invisible, and they do these things just to test the waters? We can have comfortable campouts (in places like the Berkshires in July, when there are fireflies, and with hot showers and barbeques).......or go to Sumatra economy class and stay in a home stay for $3.50 a night, and drink rice wine and bat at mosquitoes and talk about art, or crumbling temples, or Hindu mythology, or lost loves, or spiritual ecology, or petroglyphs, and live in ways that are frugal. We will talk at length. Leisurely, encircled conversations that wind and spiral around themselves, with memories that are really stories with no particular beginning, and no particular end, and all the lovelier for a little embellishment. We might burn little oil lamps to read cheap paperback books by, and fall asleep without clocks or cell phones or bras. We would allow each other our delights, and our melancholies. Exhaultations and Maudlins are welcome as well. We might write poems no one else will ever hear, and it doesn't matter. If we're feeling risqué, we might talk about Dionysus and the mysterious Eros of nature. We might remember more personal examples worth sharing. We might talk about books. We might talk about Georgia O'Keefe and Stieglitz. We might talk about jazz, we might listen to jazz. We might ask what god a gamelan is speaking about, or is it a river, or is the god or the river, or both, speaking through the musicians? We might come up with reasons why Beethoven wrote the "Ode to Joy", we might toast to every beach and river and forest we had the privilege and pleasure of walking in and talking to. We might. Here I am, in beautiful Michigan, at the apartment the Aldon Dow Creativity Center gave me. Much to say about the journey, much to say about being here and the amazing artistic resources of this place, but I feel I cannot really begin this piece, whatever it’s going to be, without telling something about the stories of Spiderwoman, the traditional stories. Even as She spins her way into many new ones, including the one that I’m going to be telling. I’ve been reading about Spiderwoman among the Navajo traditions. (They call themselves Din`e - meaning, simply, “The People”). The Navajo for those who may not know live mostly in northern Arizona and Utah, but are themselves “newcomers” to the Southwest, having come as migratory peoples into these lands from Canada some 900 years ago. I’ve heard at least one person say their ancestors may have originally come across from Mongolia, and that they share some cultural or even language similarities. I don’t know enough about this to comment at all, although I do note that the Navajo, and the Tibetans, both create ceremonial sand paintings as Blessings - invocations and prayers. I do not presume to say that I have any great depth of understanding about the sacred traditions of the Navajo. Or any other Native American peoples, although I have participated in ceremonies with different teachers. I offer my gratitude for what little I have available to me, the threads cast my way, the people I have met, the layers of universal meaning and insight these myths, their Sacred Stories, offer all of us. Enactments, ritual Tellings of the sacred stories, and the fourfold chants of the Navajo, are, like the Hindu Temple dance/dramas of the Balinese or the ancient "Mystery plays" of Greece and Rome, the foundations through which participants traverse certain ceremonies. Another way of putting it might be to say that they are “Ways” to travel, pathways designed to bring one back into harmony and balance. The restoration of Balance is the essence of many indigenous spiritual traditions - being “earth based“, they are about relationships - to each other, to the elements, to an extended family of beings with which one must co-inhabit and which are mutually dependent. When the Inuit, for example, see that they are out of harmony with the world, they notice that the ocean creatures that provide life to them withdraw, and the environment is suffering. They know then (as my mentor, Grey Eagle, described it to me) it’s time to restore spiritual, tribal, and personal balance with Sedna, the Ocean Mother, through certain prescribed long rites and ceremonies. 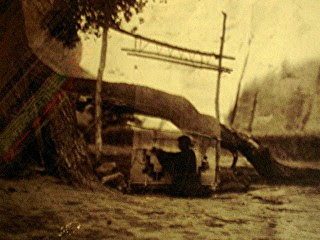 These are cycles of ritual at-one-ment, and include a profound recognition of the necessity of reciprocity with nature. The Balinese also have traditions of Balance, in fact, the interplay of so called “opposites”, the yin and yang, was what immediately impressed itself on me as the very essence of the Balinese worldview and spiritual system. The curbs of the streets themselves (“the borders of the way”) are decorated with the ubiquitous black and white checkers, found on alter clothes, and also worn by the Balinese when they go to the Temple. Like the yin/yang symbol, black and white, alternating, moving in and out of each other, black and white, light and dark, good and evil, negative and positive coexisting and forming a whole. To me, the naming of the Holy People, the twins in the Navajo (Dine`) creation story, also represent this idea of balance. When they finally achieve their true identity (and hence, the identity of the Dine` people) they are a balance to each other, active and reflective, yin and yang, and fully empowered, two that are also One. At the beginning, the Hero twins learn to walk a path of beauty, the Pollen Path, defeating the various forces that destroy and devour harmony - with the aid of Na'ashje'ii asdzaqq, the Grandmother Spider Woman. In the very beginning, the world was full of terrifying, hungry monsters that devoured people and all things good, a place of chaos. Yet, in spite of the danger, Changing Woman came forth from the safety of her shelter one day, drawn out by the beauty of the sun. The sun's rays shone golden on the shifting light of a sweet pool of water, and Changing Woman so loved the Sun's dance, and the beautiful rhythms of the waters, that she opened herself to them joyously. And not long after this, Changing Woman gave birth to two twin boys. As they grew, the twins became very close - like the sun and the moon they complemented each other. One grew strong and tall, and became a great hunter and bowman, and could run as fast as any deer. The other also grew strong and tall, but he was a great dreamer, and could read stories in the depths of the deep waters. At last the boys asked their mother to tell them who their father was. But she could not truly say, and they were shamed to not know the name of their father. They were determined to find out. Their mother urged them not to go, pointing out that fearsome beings surrounded them. She begged them to remain at home. But the twins defiantly left on their quest to find their father. Crossing a valley, they saw smoke rising out of the ground. When they drew near, they saw a ladder going down into an entranceway in the ground, a ladder with four broad rungs. And not so very far below, or perhaps very, very far below, (who could clearly tell in the shifting light of the smoke?) sat a old woman before a loom, weaving before a warm fire. She was Na'ashje'ii asdzaqq, the Spider Woman. Where did She come from, old Grandmother Spider? Who could know, since She was here before anyone else. Perhaps she was the beginning place, the center at the center of the web, deep in her home in the earth. The twins were cautious, and stepped down only one rung. They found they could not answer the questions old Spiderwoman asked them. Finally they said, “We really don’t know who we are, and we know only a very little bit about where we come from.” And with that, they stepped down a second rung into the house below the ground. “We don’t really know that either”, they said. “We’re slooking for our father, even through we don’t know his name.” And with that, they stepped down a third rung into the house of Spiderwoman, who smiled at them with great warmth. “We come from the house of our mother, Changing Woman, who has to live in so much fear, because there are so many devouring monsters that destroy our people. And we’re seeking our father, although we don’t know the way to go.” And finally, the boys stepped down a fourth rung, and onto the floor of Spiderwoman’s house. The young twin brothers came forward, and joined Grandmother Spiderwoman around her fire. And she gave them food, and they noticed then that there were many, many seats around her fire. How was it they hadn’t noticed that before? “You father” she told them, “is really the Sun, Johonaa'ei. He lives in the sky, and the way to his house is dangerous. Many monstrous beings face you on your journey, and they will block your way if they can. In fact, there are four great dangers you'll meet on the way, and no ordinary person could possibly survive them. And who knows how your father will receive you, if you do arrive at his house at last? He may test you as well." "But I’ll help you.” said Spider Woman, and she then instructed the twins, telling them the sacred chants they would need as they faced each dangerous situation, teaching them to stand strong and with clarity and courage. And she gave them a holy talisman, a being that was a hoop with potent feathers upon it, and told them how to care for it, and how to use it. Because unless they treated it correctly and with reverence, it would not work. At last, leaving the home of Spiderwoman deep in the ground, the twins went on their quest, and arrived after many trials at the home of their father. They faced four great dangers, stones that would crush them, reeds that would cut them to pieces, terrible sands that would have burned and buried them, and cactuses that would have pierced them. But with the knowledge that Spiderwoman gave them, they came through each encounter unhurt. At the home of the Sun, they encountered also four (3) guardians. And here, thanks to the Spiderwoman, they knew the correct chants and prayers, and could name each guardian, and were allowed to pass. Their father then gave them their true names - calling the eldest Monster Slayer, and the younger brother Born for the Water. To each he gave a powerful flint shield, and to each a special weapon. Monster Slayer returned after their long journey with his brother, to kill the enemies that plagued his mother, and all of the people. And Born for the Water became their memory keeper, recording all of these events and knowledge for future generations and keeping the necessary trophies deep within his mind. And all the people honored forever the gifts of the Spider woman. 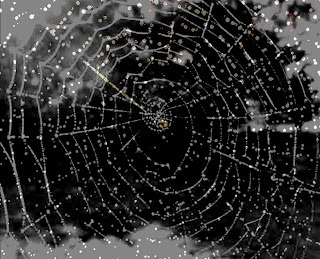 2 Carol Patterson-Rudolph, “Spiderwoman of the Dine`, ibid. 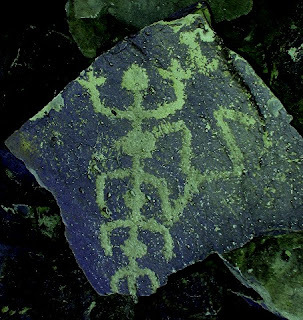 3 Four seems to be the significant number to the Navajo, just as Three and its multiples is so important among the Celts and elsewhere (triple Goddess, Trinity, etc.) To them, four repeated means that one is now entering a sacred, or ritual space, time, or intention. Four times repeated establishes RHYTHEM necessary to chant and prayer, and many levels of meaning, symbolic instead of literal meaning. Four is also the number of the four directions, East, South, West and North. Hence, a number identified with wholeness. My sense of moving into harmony with the Weaver continues as I approach the continental midpoint now. 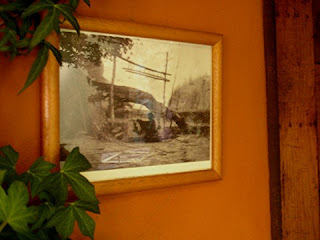 The photo above, of a Navajo weaver working on a rug, was hanging by the door to my room when I woke after sleeping at the Laughing Horse Inn in Taos. Funny I didn't notice that before I went to bed, but I laughed with considerable pleasure to notice it in the morning, feeling my silver necklace on my chest. 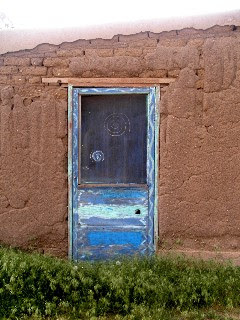 And remembering as well that this funny little adobe Inn has been around a very long time. D.H. Lawrence slept here, and many others. Perhaps some energetic thread of these "great dreamers" still lingers here........when I stop I always seem to have good dreams, or lacking that, syncronicities, which seem very much about "dreaming" anyway. A good place to be, to sleep, to wake up to in the rain. I love the Navajo words for ceremony, healing, ritual and prayer as a "Way". This is different, in my view, from speaking of a holy practice as a "service" or a "liturgy" or a "gospel". A "way" implies movement, like the course of thought and prayer, a way to walk that moves those participating along a path of increasing harmony and intention. "Way" is a journey, a trail, a pathway, a mindstream. Way is an "open system" kind of word that suggests as well the possibility of many choices. I want to write soon about some of the legends of the Spider Woman I've been reading and thinking about as I wind, in my little pink car, across the ways of the highways and interstates of this enormous land, but I don't think I can a this time. Today I have a lot of miles to cover, and so I'll have to be brief. As I write, I find myself in a Motel 8 in Kansas, it's hot and very windy, and my mind feels rather dull compared to the high imaginative spaces of Taos, New Mexico, and the awesome beauty of the Rockies. It's a bit hard, I confess, to descend literally into the flat lands, the worthy breadbelt of America, from such elevated places. Ok, I'll say it. This land, although green and pleasant, is so very tamed, on such a "human scale". 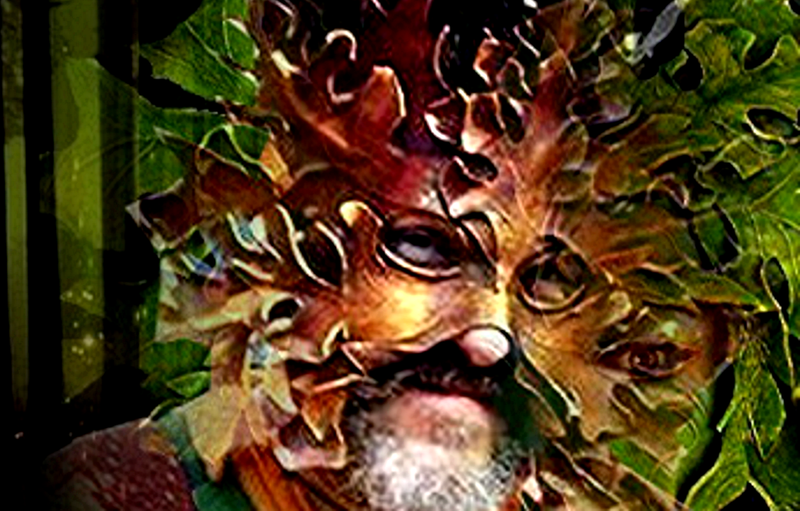 The fey folk, the kachinas, the devas, the elemental and mythic beings, if still here, are not a presence felt. Not the same experience as the wild sanctity of the mountains, the sense of being but one small note in a great Conversation of Gaia. I can understand why Georgia O'Keefe and D.H. Lawrence loved Taos. There is a quality of light, an imaginative potency, a refinement of energy there that makes even the birds and the flowers seem more vivid, more alive. In fact, I never saw a magpie, that wonderful black and white trickster bird that reminds me of the Clowns of the Hopi, until I came to Taos. And descending, they all disappeared. Maybe they prefer the heights as well. I've had the idea of making some paper weavings as backdrops for the masks I plan on making that are woven from papers on which prayers, or stories, or both, are written. Weaving them together into shrines, or even vessels in which stories and prayers yet unwritten or conceived.........can rest as yet invisible threads of future possibility. You have noticed that everything an Indian does is in a circle, because the Power of the World always works in circles, and everything tries to be round. Well, time to hit the road. Wrong choice of words. Time to continue on my Blessing Way, and let the Road Bless Me! Pulling off the road in Winslow, Arizona I entered a gas station converted into an “Indian Arts” gallery, although quite a few of the items were from Mexico. 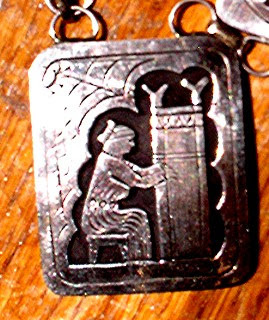 My attention was immediately drawn to a beautiful scribed silver necklace in the case - it showed a Navajo woman, with her signature hair bun, weaving at a standup loom, and behind her was a great spider web - Spiderwoman. When the proprietor offered it to me at half the price marked, I had to buy it. Putting it on, I felt my Blessing Way had, perhaps, been renewed. I don’t have a means to show the necklace here without my camera, but the Navajo artist’s name is Keith Brown. Many of the native American artists here are incredible, making mythic silver cut or turquoise jewelry, or incised and painted pots, or paintings of blue spirit horses running beneath vast skies with blessed thunderclouds forming beneath red, red cliffs. But those living in impoverished Winslow, or on the reservation, are rarely represented in affluent galleries like Scottsdale or Tubac. The energy streaming out of this magical necklace not only inspired me to buy it, but inspired me to see if I could learn more about the hand that created it. The owner of the store was, however, not interested in native mythology. He was far more intent on, unfortunately, saving my soul (I wonder if saving souls is a little heavenly merit badges........do they keep count?) He suckered me into listening to a long story from the Bible (why do these people always memorize the page?) before I realized it was time to leave with my new Talisman. If he can wear a cross, by golly, I can wear Spiderwoman. I heard one thing in his ramble that was, if he only had the means to tolerate my notion of the Divine, important to me. He said that through faith, we can be healed. As we conceive, as we think, so it is. Thought Woman weaves, and my own place in the divine, in Gaia, of Spiderwoman, of the spirit that animates the dream and the art - is a stream, the “river beneath the river of the world” 1 My journey is about faith as well, faith in the journey itself. I remember I was crying when I drove through Sedona today, driving with a bone deep loneliness. Remembering the magical mind we had in the 80’s when I and artist friends came there on our visionary excursions, remembering the 80’s, remembering friends that are gone, so damn many, remembering what Sedona used to be like before it became so commercial and gentrified and formulated, before they built a tennis resort on a “vortex“, a sacred place of ancient earth energy, Boynton Canyon, remembering when there were medicine wheels on the path into the canyon, instead of so many "keep out" signs. Wondering, as always, how we can have a culture with such technology, and yet such blind ignorance about the obvious. The Goddess communicates in mysterious ways, and I left the Indian Arts Gallery to find a motel in Winslow, Arizona, with my talismen, my Blessing, around my neck, clanking down a dusty street with a glorious sunset before me. The proprietor of the Lodge Inn (whose door, I noticed, says proudly “For the REST of your life”) is a young, very blond woman with a very brown old dog keeping her company, and a cheery, California demeanor. When I showed her my new necklace, telling her how excited I was about this work, whatever story I can glean about the artist, and my own journey to create “THREADS OF THE SPIDER WOMAN “ she got right to work on my behalf. I think Grandmother Spider woman is with her as well. She asked me if I knew where the La Posada motel was, she said she was supposed to meet someone there, and walked into the store with its grumpy proprietor to ask directions. I had a good feeling, that brief moment, of meeting a kindred spirit in an unlikely place. I might have asked her and her companion if they would like to share the Budweiser, if I wasn't so shy these days. Do we still live in a dimension where there is “world enough and time” for such spontaneity? I was barely moved into my room when the phone rang. "I have some news!" the blond proprietor said. "You must go visit the gallery in a famous hotel here. 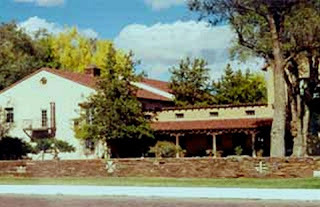 It's called "La Posada", and it was designed by a famous woman architect whose name was Mary Colter. There's an art gallery there now, and the woman who runs it has some work by the artist who made your necklace, Keith Brown." "And” she added, “you have to see the hotel! This woman was way before her time." And so she was. I wonder what "La Posada" means? I'll find out tomorrow. I’m off to the Aldon Dow Creativity Center, Michigan’s former architect laureate. A student and colleague of Frank Lloyd Wright as well. I like it a lot that all of these people were, in essence, creators of sacred places. 2 I can’t help noting that the word Religion, as we’re on the subject of links in the great Web, comes from the Greek, Religios, and means “linking back”. The same root word, in fact, from which “link” is derived. with beauty it is finished. Tomorrow I begin my creative pilgrimage, following the trail of the Spider Woman, crossing this vast country, following whatever threads She may care to cast my way as I seek to find out what this work of art will become. And to find out how to weave my own spirit into a kind of co-creative harmony I, in all honesty, haven't felt for a long, long time. It's occured to me what I’m really seeking is a BLESSING. And, from that, to give a Blessing back. The logic of Spiderwoman, at least as I conceive of Spiderwoman, the logic of nature, is circular. If synchronicity can be the touch of the Spiderwoman, if a synchronicity or two could be touchstones along the path, well, I'm off to a good start as I pack my car. Just two days ago, I was helping playwright Randy Ford, the creator of El Ojhito Springs Creativity Center in downtown Tucson, to pack up this lovely and much needed venue for artists and performers.........into a moving truck. They have been evicted, and like the Muse Community Arts Center two years ago, the wheels of real estate, progress, and cultural soul loss turn in Tucson relentlessly. (I could say a lot, but I won't, not right now and not right here.) This Journey is about renewing my unitive vision as an artist, as a person living in these confusing times. And, taking the journey, making the effort to tell what is seen. I determine to not focus upon the many opposing forces each and every day brings. How "individual" are we, really? I tend to feel, when engaged in the creative process, that a lot of my "separateness" breaks down, and the unitive nature of mind makes itself more obvious. That's a far cry, I suppose, from the Modernist concept of the artist as alienated genious. Forgive my digression - I was reading that morning about Spiderwoman as She occurs in Navajo mythology, reading as well some of their beautiful chants. Chants used by "Singers in various curing ceremonies, among them, the Blessing Way. Randy needed boxes, and so I went to U haul to purchase a few. Standing in line, I saw I was behind a couple with a little girl, heading for Window Rock, Arizona. They were speaking in Navajo. Well, let the road lead on. 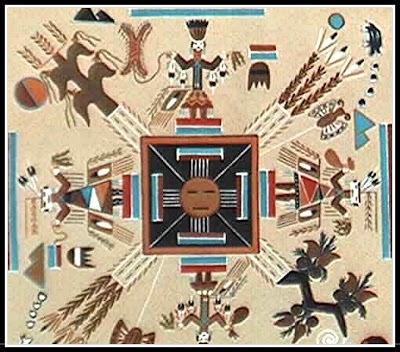 ** Wyman, Leland C. , 1983 Navajo Ceremonial System. In Handbook of North American Indians. A. Ortiz, ed. Pp. 537, 541, Vol. 10. Washington: Smithsonian Institution Washington.